Who does most of the cooking in your house? If that duty falls on your shoulders then you know how important it is to have the right “tools.” All the fresh ingredients in the world won’t matter one bit if you’re stove is on the blink. You know it’s time for a new stove when food is ending up getting burnt or not cooking thoroughly. If it has been a while since you bought your last stove there are plenty of things you’ll want to consider before settling on your model. First up, you’ll want to measure your current stove and the space where it lives. Most stovetops come in the range of 20, 24, 30 or 36 inches wide. If you’ve got some wiggle room on either side of your stove then you might benefit from an expanded cooking top. Otherwise you want to make sure you’re getting the right fit. Next you’ll want to look for the features that are going to make your time in the kitchen more pleasurable. For instance, a self-cleaning oven is a terrific enhancement that will insure you stove is always “good to go” without ingesting those fumes from an oven cleaner. Many modern stove designs come with built in computer programming that allows for easy touch controls. You might not be able to fire up a stove in the store but you can certainly check on how the door opens and closes and whether or not the oven light is bright enough. 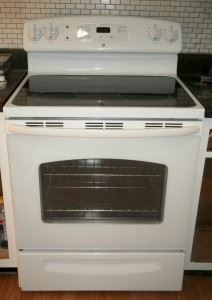 As soon as you settle on your new stove, you’re going to need to make arrangements to get rid of that old model. That can happen with a single call to Junk King Stockton. These are the Stockton based junk removal experts who won’t have a problem loading up your old stove onto the back of their truck. In fact, they’re not going to have a problem loading up anything you want to toss out. Take a tour of your garage, closets and attic. Is there anything in there you want to throw out? Chances are you could clear out a lot of space if you put your mind to it. Remember you’ll have a hard working two-man crew to do all the heavy lifting work. That means anything can go! When it comes to pricing, Junk King will provide you with an estimate of how much space your junk will take up on their truck. Since they like to pack their trucks tight, you can bet this will be a very affordable fee. Give Junk King a call today and you’ll be junk free in no time! This entry was posted in Junk King Stockton, Lodi Appliance Disposal, Old Stove Removal and tagged Old Appliance Removal, Old Stove Removal, Stockton Stove Removal on August 23, 2013 by Carlos Duenas. Last updated August 2, 2017 .